Photocatalysis Air pollution is due to its complexity of primary emissions, long-range transport and the formation of secondary air pollutants still an acute risk for the environment and human health. Nitrogen oxides (NOx) play an important role, since they contribute in combination with volatile organic compounds (VOCs) to the formation of the secondary air pollutants ozone (O3) und particulate matter (PM). Main anthropogenic sources include industry, power plants, agriculture and transportation. Therefore, densely populated urban areas are exposed to high levels of air pollution. The application of photocatalytically active materials is one new potential approach to improve urban air quality. The aim of the studies at TROPOS was to assess the potential of photocatalytically active cementitious based (construction) materials to reduce air pollutants such as NOx, O3 and selected VOCs. Laboratory experiments using small scale photoreactors were performed to evaluate the photocatalytic activity by determination of uptake coefficients under variation of experimental conditions (relative humidity, flow rate, mixing ratio and light intensity). 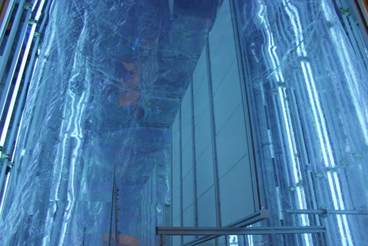 Also, the impact of rain could be simulated by a specially developed laboratory photoreactor. Additionally, the possible formation of secondary reaction products was investigated in aerosol chamber experiments. View inside the aerosol chamber equipped with the set up to investigate the photocatalytic active material (UV-light on). The results from these laboratory experiments were then validated by the participation in large-scale field experiments. Laboratory experiments demonstrated the general potential of the used material to photocatalytically reduce the tested air pollutants. However, it became already clear in these laboratory studies, that the photocatalytic activity is in part significantly dependent on the experimental conditions. Application of these materials in field experiments finally resulted in a realistic value of only a small percentage of pollutant reduction (e.g. for NOx ≤ 2%) under urban environmental conditions. In addition, under certain conditions, the formation of undesirable reaction products (e.g. O3) was observed for the tested material. That represents a potential risk for human health and the environment and has to be controlled prior application. The results of the present study demonstrate that the application of the tested photocatalytically active materials can only be considered as an additional approach to other measures to improve urban air quality. Boonen E., Akylas V., Barmpas F., Boréave A., Bottalico L., Cazaunau M., Chen H., Daële V., De Marco T., Doussin J. F., Gaimoz C., Gallus M., George C., Grand N., Grosselin B., Guerrini G. L., Herrmann H., Ifang S., Kleffmann J., Kurtenbach R., Maille M., Manganelli G., Mellouki A., Miet K., Mothes F., Moussiopoulos N., Poulain L., Rabe R., Zapf P., Beeldens A. (2015) Construction of a photocatalytic de-polluting field site in the Leopold II tunnel in Brussels. Journal of Environmental Management 155, 136-144, doi: 10.1016/j.jenvman.2015.03.001. Gallus M., Akylas V., Barmpas F., Beeldens A., Boonen E., Boréave A., Cazaunau M., Chen H., Daële V., Doussin J. F., Dupart Y., Gaimoz C., George C., Grosselin B., Herrmann H., Ifang S., Kurtenbach R., Maille M., Mellouki A., Miet K., Mothes F., Moussiopoulos N., Poulain L., Rabe R., Zapf P., Kleffmann J. (2015) Photocatalytic de-pollution in the Leopold II tunnel in Brussels: NOx abatement results. Building and Environment 84, 125-133, doi: 10.1016/j.buildenv.2014.10.032. Gallus M., Ciuraru R., Mothes F., Akylas V., Barmpas F., Beeldens A., Bernard F., Boonen E., Boréave A., Cazaunau M., Charbonnel N., Chen H., Daële V., Dupart Y., Gaimoz C., Grosselin B., Herrmann H., Ifang S., Kurtenbach R., Maille M., Marjanovic I., Michoud V., Mellouki A., Miet K., Moussiopoulos N., Poulain L., Zapf P., George C., Doussin J. F., Kleffmann J. (2015) Photocatalytic abatement results from a model street canyon. Environmental Science and Pollution Research 22 (22), 18185-18196, doi: 10.1007/s11356-015-4926-4. Mothes F., Böge O., Herrmann H. (2016) A chamber study on the reactions of O3, NO, NO2 and selected VOCs with a photocatalytically active cementitious coating material. Environmental Science and Pollution Research 23 (15), 15250-15261, doi: 10.1007/s11356-016-6612-6.